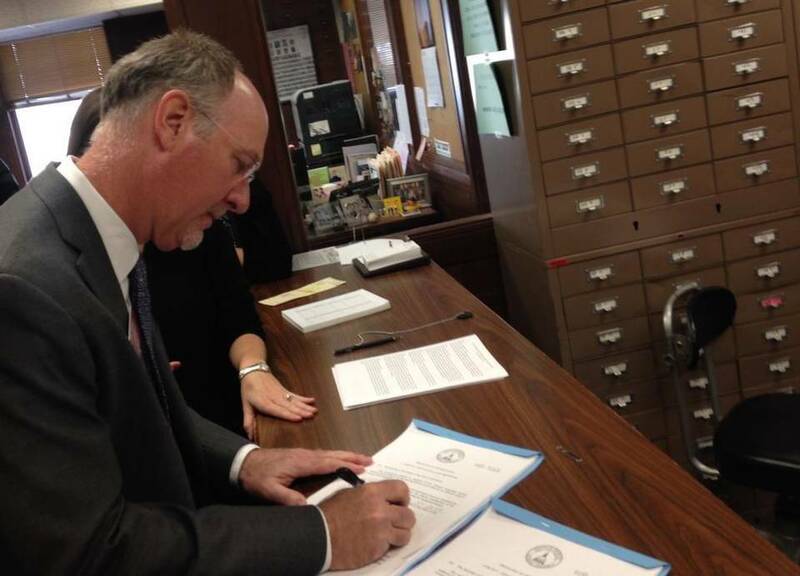 State Rep. Allen Peake, R-Macon, pictured here at the state Capitol filing a medical cannabis bill in 2016, said he’s preparing another medical cannabis bill for the 2017 session. Election Day was a winning day for marijuana. Voters in eight states approved either the growth of recreational marijuana or, like Florida, the production of medical cannabis. Those votes will increase pressure for change in Georgia. “We were obviously encouraged by all the positive votes,” said Shannon Cloud. She and her husband, Blaine Cloud, are two of Georgia’s most vocal medical cannabis activists. Their 11-year-old daughter, Alaina, has taken a liquid made with cannabis to treat the symptoms of a rare seizure disorder. “The fact that Florida passed medical was a huge win. We’re not that different from Florida. We are hopeful that we could get it on the ballot here in 2018,” Shannon Cloud said. What Florida passed is the licensed cultivation, manufacture and sale of cannabis products to Florida patients who have a medical marijuana card. So Georgians will be greeted with a new Florida curiosity when they head south on vacation: medical marijuana dispensaries. But in Georgia, unlike Florida, the question of medical marijuana cultivation must go through the state Legislature before a public vote. In Florida, supporters bypassed the state Legislature, instead collecting nearly 700,000 signatures to put the question on the ballot. The Macon restaurateur who sponsored the bill that created Georgia’s medical cannabis registry said nationwide momentum and poll results favor medical cannabis. “It’s coming. It’s now in 29 states, after Election Day, that have full-blown medical marijuana programs. It’s coming to Georgia at some point,” said state Rep. Allen Peake, R-Macon, counting medical-only cannabis states such as Florida, plus places like Colorado that allow recreational marijuana too. Peake wants Georgia to move to that list of “full-blown” medical cannabis states: those that allow the licensed, in-state growth of cannabis for sale to patients, like Florida; or even like Louisiana, where two universities want to be cultivators. Georgia allows possession of some kinds of liquids made from cannabis, but the roughly 1,058 registered patients have no legal way to get the product because it can’t be grown or made here. Companies or people that ship or carry all but the weakest products over state lines are breaking federal law and state laws. Those states that allow cannabis cultivation get away with it only because federal authorities have broadly chosen to ignore the law-breaking, especially for the kinds of products that many patients seek. But the laws remain on the books. And cannabis advocates felt a chill from Washington, D.C., earlier this month when Republican President-elect Donald Trump nominated Sen. Jeff Sessions, R-Ala., as attorney general. Sessions has been clear about his anti-marijuana stance, saying marijuana is dangerous and is causing a disturbance in the states where it’s legal. Peake is so frustrated with the federal ban that he’s been breaking it to get cannabis oil to Georgians who don’t have the money, the health or the job flexibility to travel to cannabis states. “We’re getting medicine to people now. We’re working around the law,” Peake said, declining more detail. Peake and supporters of in-state growth have already started campaigning ahead of the January start of the state legislative session. The lawmaker is promoting a campaign video that shows families how to get and brew cannabis oil themselves. Georgia Republican Gov. Nathan Deal has opposed in-state growth, saying he’s not convinced that the state can control the industry and that he’s not sure there’s enough demand for such products to support operations. Deal’s spokeswoman declined comment, saying that the office does not comment on pending or possible legislation, and she did not respond to a more general follow-up question about Georgians seeking medical cannabis on the black market. Peake said if cultivation doesn’t get support, he’ll try to expand the list of diagnoses that qualify for a Georgia medical cannabis card. Democratic legislators have proposed more radical bills, such as decriminalizing small amounts of marijuana or setting up a referendum on legalization. None has gotten a hearing in the GOP-dominated Legislature. Law enforcement from prosecutors to cops to the GBI director have fought in-state growth. Some say that cannabis greenhouses meant to supply patients will cover illegal grows, and maybe, lead to legalization of the recreational stuff. “What we’re going to feel is the pressure from some factions … to legalize it in Georgia. There’s never been any secret that that is the desire and intent of a lot of people in the state,” said Terry Norris, executive director of the Georgia Sheriffs’ Association, speaking about two weeks after the Florida and other states voted. He’s worried about what he foresees with more marijuana: more traffic accidents, worse unemployment, more victimization. “Without question in my mind it’s more widely accepted. It’s more or less to me a sign of a lot in society anyway. … Ignoring the law and doing what one wants to do is becoming the norm,” Norris said. Another problem is ethical: law enforcement officers swear to uphold the law, be it state or federal. And Georgia politicians who support cannabis would be asking officers to ignore a pretty big federal law. Bibb County Sheriff David Davis said he thinks there’s the beginning of a paradigm shift as far as the public’s perception of marijuana. So he’s watching how loosening in other states affects his counterparts’ work. There are challenges, he said, like how to test if someone is too impaired from marijuana to drive. Or how to deal with the increased risk of money laundering. Banks are supposed to eschew illegal businesses, so marijuana businesses tend to use a lot of cash. But Davis also said he imagines that 80 or so years ago, as alcohol prohibition was cracking apart, officers were asking themselves similar questions about new law enforcement challenges. In part, it was figuring out how to ensure public safety when a popular illegal substance was coming out of the shadows.